Some have noticed a small hiatus in this blog. For the first time in more than nine years, I have spent more than a month without touching my camera as life events overtook the need to "find a photo"! This has been no bad thing, however as many are aware life for us is divided between two hemispheres, which usually entails a frantic search for photographs in the months leading up to departure, but this time, there were none. I thought it may be interesting (for me at least) to go where we've been before, so each day between now and mid November I will republish a post from a month in the past. Of course the format of the blog has changed since then, so those viewing it on its front page may have to put up with some odd formatting, but hopefully I will not be the only one looking back with fond nostalgia! 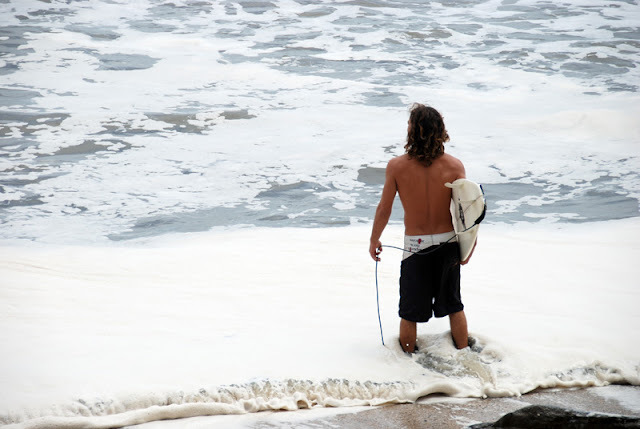 This from March 2009 of a Surfer pausing to contemplate his future before heading out into the fray, could well be a metaphor for where I presently stand contemplating what this blog will bring after November. I haven't deserted the web though, I am still attempting a glimmer of the other part of our lives on our Fading Memories blog. and expect to be back photographing the Sunny Coast "by Christmas"!